We garden designers often have to be flexible beasts to meet our clients expectations. When it comes to the construction phase of a garden project some clients have a person or company in mind that they would like to use to build the garden for them. More often than not, this will be the builder who did an excellent job with their house extension project and has worked for them on and off for years. My heart sinks when clients tell me that they wish to work with their builder. Not because I don’t believe that their builder did an excellent job or that I am questioning their ability as a skilled craftsman, but because landscaping is a completely different discipline to a house building project. If I turned it round and announced to my architect that I wanted to use my brilliant landscaper to build my extension, you’d all think I’d gone mad! So why do so many people think that building a garden is less complex than building a house, and why do they think that building work in the garden will cost a fraction of the figure of building work in the house? If you think about it for a second, this just doesn’t add up. For a start, the materials costs will be comparable – whether you use natural stone in the kitchen or on your terrace it will always be more expensive than a manufactured product and why would a skilled bricklayer, for example, cost less to employ in the garden than they would cost in the house? I have worked with builders in the garden and it has taken a huge investment of my time to ensure that garden is delivered as it should be. A good landscaper will know that you need to plant at the bottom of a retaining wall and will ensure that the foundations are installed in a way that will enable this to happen. They are used to working with the complexities of the land and setting the finished levels as per the designer’s drawing. They know that when you lay a random paving pattern that any continuous joints of more than 3-4 slabs will just look awful, that pointing a terrace with a bucket handle joint (as a regular brick wall would be pointed) will be impossible to sweep, that the planting beds are not a place to bury the rubble that should have been removed from site. Please don’t think that I am disrespecting the building trade, but it’s time to give landscapers the credit they deserve. They are skilled craftsmen who do it all, build walls, lay paving, install irrigation, create water features, prepare soil for planting, plant trees and plants, read drawings, deal with levels, tricky soil conditions, erect fences, install lighting…need I go on? 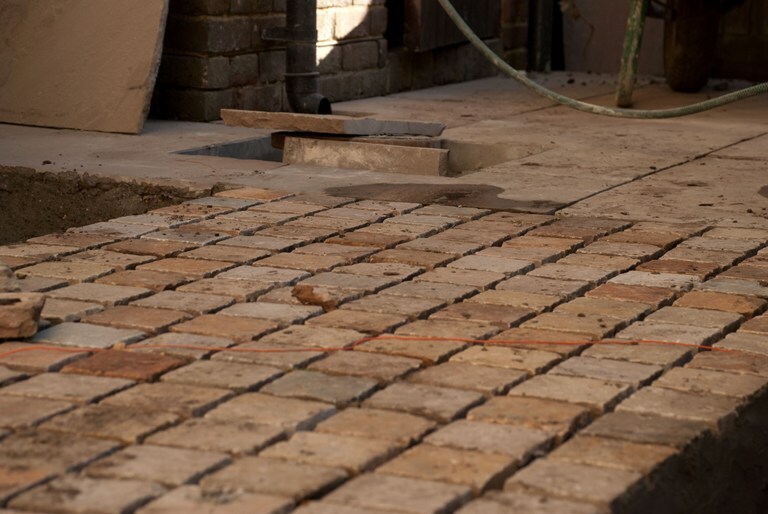 While you raise some interesting points and we agree with much of what you say, we disagree that builds can’t produce as good a job as a landscape contractor. The fault often lies with the designer’s inability or reluctance to provide adequate construction and specification detail. If you have laid out the project in sufficient detail as part of the contract, it shouldn’t matter who does the work landscaper or builder. We agree that someone with horticulture training is required to prepare and plant the borders, but builders are just as capable of laying paying and building ponds and in some cases more so. I agree that many designers do not provide adequate construction and specification detail. I consider this part of the design process to be one of the most important because it communicates the design clearly to the contractor. I also provide sketches and drawings of how I want particular elements to look which really helps to communicate my vision. Perhaps I have been unlucky with the builders I have worked with. If they are professionals who really care about the work that they do and they respect the designer’s ability to design then I’m sure it could work well. I was trying to demonstrate that Landscaping is a professional practise in its own right and should therefore be regarded as such. You may be interested to know that I have taken up this theme on my own blog and also linked to this article and your excellent website. Thanks Duncan – I’ll be interested to see what response you get. Thanks also for links to my website and the blog – glad you like them!